The mayor and residents of Woodland Park and Little Falls are blaming the owner of a car dealership for the damage that flooding did to homes. But a day after the dealership owner disputed those claims to News 4, residents remain convinced the business is at least partly to blame. Adam Kuperstein reports. 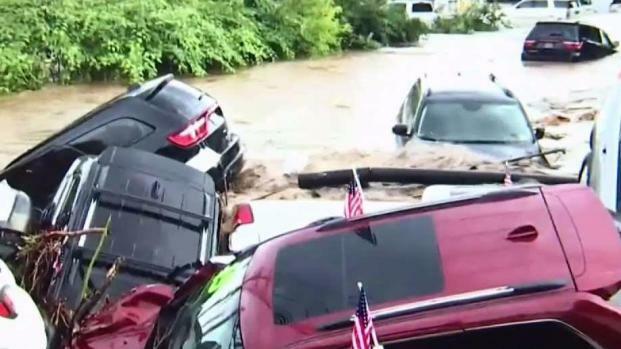 The owner of the New Jersey car dealership where dozens of vehicles were swept away by flash floods over the weekend wants to set the record straight amid backlash from neighbors who blame the business for diverting floodwater into their streets and homes. 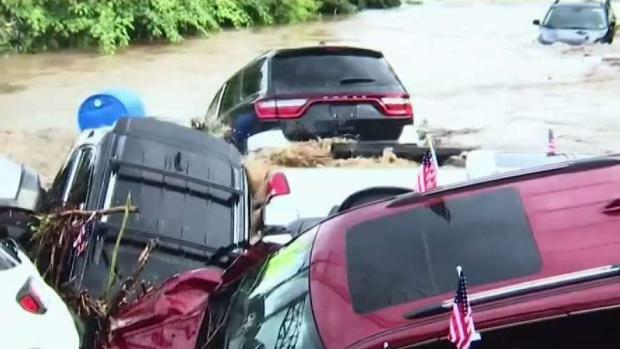 Frank Esposito, owner of the Route 46 Chrysler Jeep Dodge in Little Falls, tells News 4 in an exclusive television interview that he understands why nearby homeowners are upset by their flood damage, "but I didn't cause it. I was a byproduct of it." Video of the vehicles from the dealership being swept away by the flash floods and piling up against a bridge in the Peckman River quickly went viral after the storms Saturday. Forty-two cars in all washed away and stacked atop one another, and officials said that created a makeshift dam that diverted water to the streets and flooded homes around the river. Woodland Park Mayor Keith Kazmark said Monday, "There is no doubt that there was a wave created by the blockage of those vehicles under Route 46." A viral video of flooding at a car dealership is now at the center of a war of words. Adam Kuperstein reports. But Esposito disputes that, telling News 4 the cars never formed a dam, and he refutes the notion that his cars were too close to the river -- in fact, when the water began rising, his team moved all the cars away from the river. Esposito also pointed out that in the widely seen video, the water overtook the lot and the dealership itself. He showed another video from the back of the lot showing cars being lifted up and swept away. "If the water was dammed, it would have gone over the top of the bridge," he said. "It never did." As homeowners continue to clean up what's left of their belongings, many still blame the dealership. But Esposito gets emotional thinking of his 130 employees, many of whom rushed in to clean the place and get it reopened for business. "When I got here on Sunday morning at 7:30, the place was full of our employees to open our doors up," he said, choking up. Esposito, who's owned Route 46 Chrysler Dodge Ram since 2008, is asking for people to take another look at that viral video and see that his business, which was back open for business on Monday, was also a casualty of the wild storm. "There's nothing I could have done any different that could have changed that," he said. Frank Esposito, owner of the Route 46 Chrysler Jeep Dodge in Little Falls, wants to set the record straight amid backlash from those who blame the business for diverting floodwater into their homes. Rana Novini reports. Torrential rains since Saturday damaged hundreds of homes and prompted local states of emergency in nearly a half-dozen New Jersey counties. Some communities got enough rainfall for an entire month over the last few days.